This week I was lucky enough to be in Maryland where I discussed my “vegetarian crab cake” idea with James’ mom. Apparently, this is not a strange idea in the Old Bay State and Eleanor was almost immediately able to put her hands on a photocopy of an article “Not Quite Crab” (author, date, and publication did not make it to the Xerox machine). The article included two recipes for Zucchini Crab Cakes which had appeared in Maryland community cook books and it was exciting to see evidence of a vege-tizing tradition around this traditional and revered Maryland food. Zucchini and crab are both in-season in the summer, but since there are no zucchinis to be found this weekend I used turnips, which impart a little more earthiness and spice. Combine grated turnips and salt in a large bowl. Allow the turnips to drain for at least four hours. Drain the excess liquid from the turnips, then add onion, Old Bay seasoning, egg replacer, and melted butter substitute. Combine thoroughly with your clean hands. Pour breadcrumbs into a shallow dish and set aside. Form the “crab” mixture into fist shape balls squeezing firmly to remove excess liquid. Roll the balls in the bread crumbs the transfer to a greased cookie sheet and flatten gently with the palm of your hand. Repeat until all of the “crab” mixture has been used. 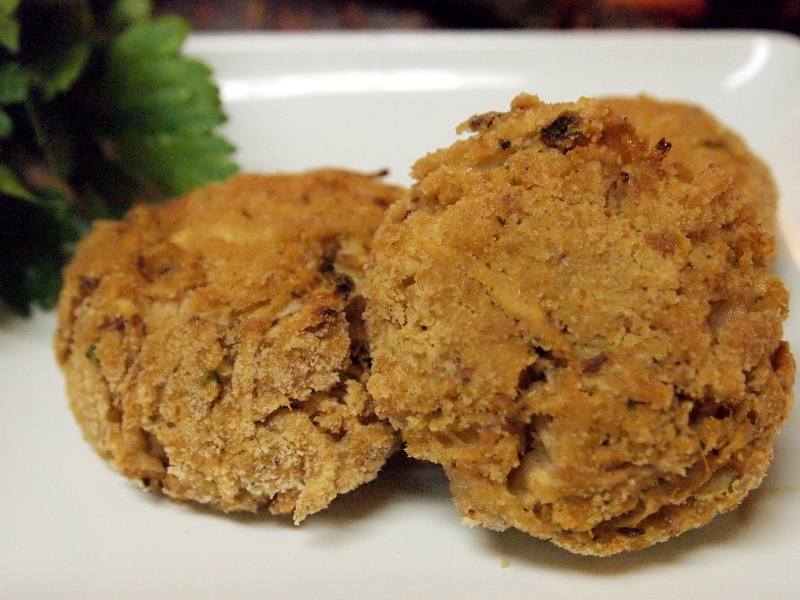 Bake the crab cakes at 350 degrees Fahrenheit for 10 minutes. Turn the cakes with a spatula then return to the oven and bake for another 10 minutes. Serve warm with your favorite creamy sauce.